When I first found out I could produce a book and put it out into the world all by myself, I got so excited I jumped at the chance. Then I jumped a second time, and a third. Suddenly, I wanted to self-publish everything. Within a few months, I had several projects planned and– yep, I basically got wayyy ahead of myself. Not all of the projects I planned saw the light of day, in the end, and I think that’s for the best. As I said in my previous post, I wasn’t ready to self-publish when I first did. I just didn’t know enough to realize how much I didn’t know. In part, I’ve been thinking about this because I’ve joined the recently formed Irish Independent Authors’ Collective. It’s also on my mind because I’m trying to get traditionally published at the moment as well. 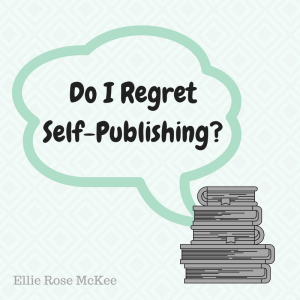 At some point, I started thinking a bit more long-term and realized that all of my impulse publishing decisions might have hurt my writing career in the long run, which – oops? Let me not beat around the bush: the very first books of mine ever printed were sub-par quality, and I’ve had to spend a LOT of time and effort re-doing them in the years since. The editions available to buy now I’m mostly okay with but, if I could do it all again, I’d have brought out fewer titles and spent more time over each of them. I would still have self-published Juvenilia (the bind-up of my teenage poems), brought out a poetry chapbook as a stepping stone to submitting a full-length poetry collection to traditional publishers, and maybe released a short story collection (that just had stories and was not mixed in with poems) as I worked towards my novel, which I would aim (and still do aim) to get traditionally published. I like the idea of being a “hybrid” author – having a foot in each camp – a lot. In the modern day, I think it makes sense to try and build an audience while you’re trying to attract an agent. BUT – and here’s the kicker – only if you’re ready. Self-publishing a book badly is undoubtedly worse than having nothing published at all. Going back to my own specific experience, I have been genuinely tempted to take all of my previous works off the market, change the pen-name I write under, and start again from scratch. Except, you know, the small issue of this being the twenty-first century and clean slates being virtually impossible due to the internet. At this point, I can only do my best going forward. One day, I would like to see a poetry collection of mine traditionally published. In the meantime, I want to self-publish the two micropoetry collections I already have in the pipeline. In terms of fiction, I’m considering self-publishing to be a backup plan if I can’t find an agent for my novel, but I would really, really like to follow the traditional route for that if possible. If there is a takeaway point from all this, it’s not to discourage others from self-publishing – a lot of other people have done it right and done brilliantly from it, right from the get-go (Claire Savage springs to mind as the perfect example here) – I just urge prospective self-publishers not to rush things, do your research and, for the love of god, hire a professional editor and proofreader. Seriously. Yep. I was so excited to get my books out there, and then I joined some FB writing groups and learned so much. I feel like I did everything backwards. Thankfully, while they are not perfect, I am a pretty good proof reader and people have enjoyed the stories. Now I am stuck and not writing any books at all because all the negativity came crashing down on me. I’m sad to hear you’ve stopped writing. You should use what you’ve learned to keep going and improve even more. If people have enjoyed the stories, where did the negativity come from? I left teaching because I had had enuFF with an emphasis of the Fs! I was very lucky because I’d had a year as a teacher on secondment in the Ulster Folk and Transport Museum and could see a niche in the market for local history. (I had been traditionally published by Longmans and UFTM published my work.) I went on a couple of business courses to learn about being legal with things like accounting and launched Adare Press, self published and used money I made writing books such as ‘Speakin’ Norn Iron as She Shud be Spoke’ to publish some other writers, such as Nora Bates, ( ‘Up the Down Street’ )and Dolly Skuce (Magic Lanterns to Moon Landings). I also worked with Billy Simpson, which was hilarious and Liz Weir. I was very lucky as I had several local best sellers, some things did O.K., others tanked. Distribution became very difficult, I had a car accident and stopped self publishing. You make a greater profit self-publishing BUT you take bigger risks.You’ve all the hassle of getting an IBSN and book design. That’s important. Then you have to arrange your own publicity, not that publishers are much help there. Just remember if you get rejected it may be the publisher’s loss for being stupid! THINK OF HARRY POTTER! That book was turned down 59 times, or so I’ve been told. I’d say persistance pays, just keep going and really study the market. There’s no point in producing something that’s not going to sell. Ellie, you write so well you’ll win through in the end. Keep going. Thanks, Doreen. You certainly have a lot of experience behind you.